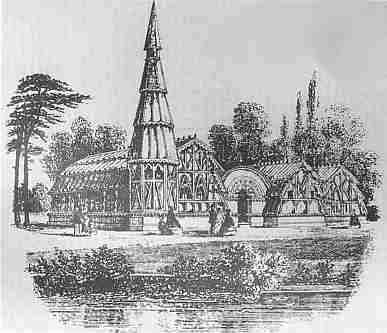 The Pump Rooms, as laid out in their heyday with timber cladding and a single-storey attendant's cottage. Various accommodation was provided for visitors and the streets were paved so that they could promenade and keep clean. Unfortunately, the expected influx of visitors never took place and it has had a struggle to survive. The name spa used for resorts at Saline springs comes from the town 'Spa' in Belgium in the 16th century. In the medieval period the Spas in England were in the form of Shrines to Pilgrims e.g. at Walsingham pilgrims had two holy wells associated with the Virgin Mary. This all finished at the Reformation.Curative powers were then attributed to certain chemicals in the water rather than faith. Resorts such as Buxton and Bath flourished in the 17th century. In the 18th century hundreds of new springs were discovered and promoted with some of the holy wells being refurbished.Spas copied the plan at Bath where associated with the waters were pump rooms, promenade and a formal setting. The visit of Queen Anne in 1702 to Bath set the scene. The first spring in Tenbury was discovered in 1839 when the landowner, Mr. S. H. Godson was searching for a better drinking water supply and dug down into the brine mineral water layer. Granville visited the well in 1839 and advised on modifications to the well structure in order to seal it from land springs which would dilute the mineral water. He also sampled the water and took temperature readings and analysed it for its chemical content. He found the water contained Iodine and so could uphold the water's claim to have healing properties. In Grenville's opinion the town needed ' baths pump rooms and a promenades, lodging houses, walks roads and other accommodation in order to constitute a Spa of the first class'. Septimus Godson could not manage to convert his land at The Court due to public opposition, so Granville explored the area for suitable locations. He sent his son, an architect, who was also familiar with Spas to survey the site and chalk out the desired improvements. No further action was taken at the time except to employ bands to entertain the visitors to the Spa. A small red brick bath house was constructed in 1840, but this was deemed unsuitable by Grenville. Mr. Price of the adjacent Crown Inn decided that one well was not enough to supply the amount of bottled water needed. He commenced sinking a well on his premises and on August 24th 1840 at a depth of 42ft he reached the mineral water layer. This opposition was soon bought out by Septimus Godson.